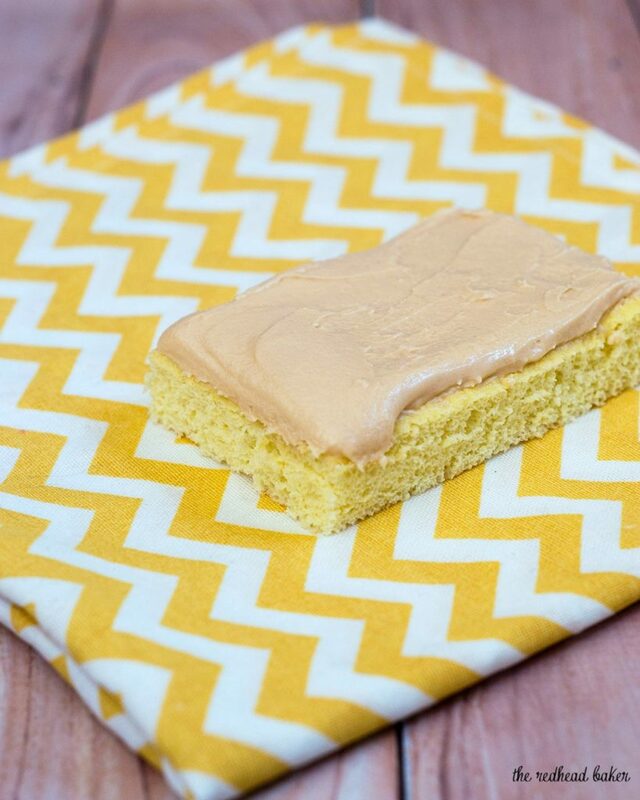 Butterscotch Krimpets are sponge cakes topped with butterscotch frosting. They originated in Philadelphia, and are a local institution! When people move away from Philadelphia, there are a few things they miss. Family, sure, but then there’s the food. You just can’t get a decent cheesesteak outside of the tri-state area (Southeast PA, South Jersey, and Northern Delaware). The soft pretzels. And a brand of baked snack cakes called TastyKakes. TastyKakes are moving toward being available nationwide, but for a long time, you’d hear about local families putting together care-packages: shipping cases full of these addictive snack cakes to family that had moved away. Probably the most popular of their line of snack cakes are Krimpets. 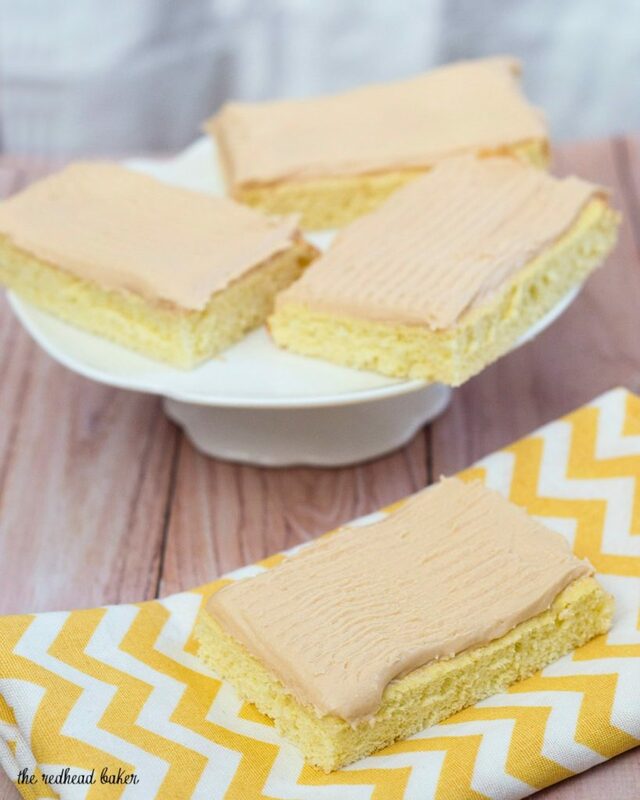 The little sponge cakes have a distinctive not-rectangular shape, and a layer of butterscotch frosting on top. It’s hard to achieve that shape when making them at home, so I cut mine into plain rectangles. Sponge cake is different than most other cakes becaues it contains very little fat. It gets most of its rise from whipped eggs. This particular recipe is easiest to make if you own both a stand mixer and a handheld mixer, as the whites and yolks are whipped separately. If you own only one mixer, I recommend beating the whites first, transferring them to a bowl, then whipping the yolks. The whites will not deflate while you whip the yolks, and if you don’t clean the bowl completely, a stray trace of egg yolk will prevent your whites from whipping. These little cakes can be stored at room temperature for up to a week. I recommend letting them sit uncovered for about 30 minutes to let the frosting crust over, then gently laying plastic wrap over top. This will prevent the frosting from sticking to the plastic. Kids and adults alike love these cakes. They make a delicious after-school or playdate snack, or pop one into your spouse’s brown paper lunch bag for an afternoon treat. This recipe assumes you have a stand mixer and a hand-mixer. If you only have one type of mixer, whip the egg whites first, transfer to a bowl, then whip the egg yolks. Preheat your oven to 350 degrees. Line a 9x13 baking sheet with parchment, letting some parchment hang over the two long edges. In a small bowl, combine the water, vanilla and lemon zest. In another bowl, stir together the flour and 3 tablespoons of the sugar. Reserve another tablespoon of sugar to beat with the egg whites. In a large mixing bowl, beat the egg yolks with the remaining 3/4 cup sugar on high speed with the whisk attachment until thick and the mixture falls in ribbons from the raised whisk. Lower the mixer speed and gradually add the water/vanilla/lemon mixture. Raise the speed back to high and beat for 30 seconds. Use a fine-mesh sieve to sift the flour/sugar mixture onto the yolk mixture and set aside with mixing the flour into the yolks. In another mixing bowl, beat the egg whites until frothy. Add the cream of tartar, and beat on high speed with the whisk attachment until soft peaks form. Gradually add the reserved tablespoonful of sugar and continue beating until stiff peaks form. Using a rubber spatula, transfer about a third of the beaten egg whites to the yolk mixture, and use a folding motion to combine the yolks, flour mixture, and whites. Add another third of the egg whites and fold those in, then add the remaining whites and fold those in. Gently scrape the cake batter into the prepared pan, and use an offset spatula to gently spread the batter into an even layer, smoothing the top as much as possible. Bake at 350 for 15 to 20 minutes, until golden on top and the edges begin to pull the parchment away from the pan. Remove the cake pan from the oven and set on a wire rack to cool. 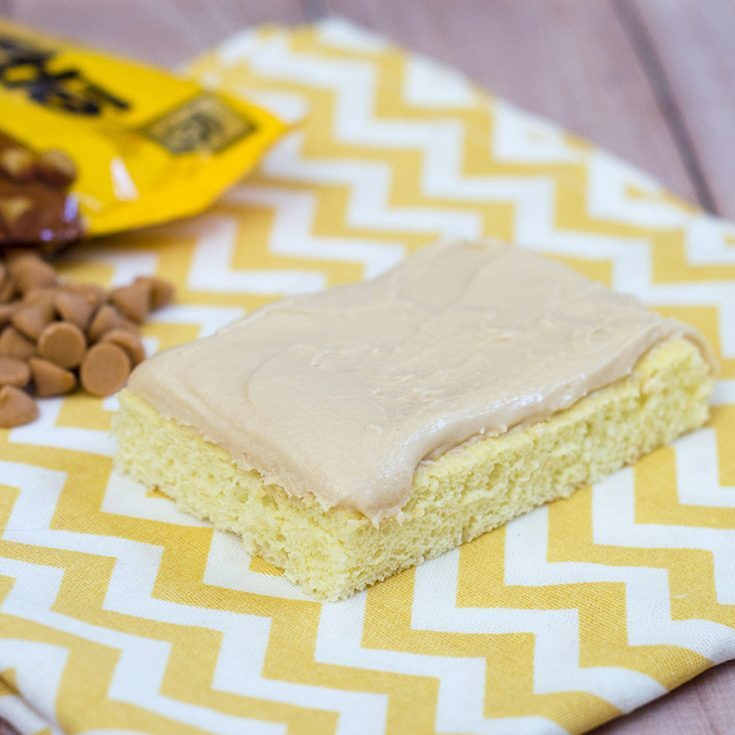 Once the cake is cooled, make the frosting: place the butterscotch chips and butter in a microwave-safe bowl and microwave on HIGH for 1 minute, stirring after 30 seconds, until fully melted. Whisk until smooth. Set aside to cool for a few minutes. In a mixing bowl, beat together the butterscotch/butter mixture, the sugar, milk and salt, until fully combined and lighter in color. If it's too thin, add mores confectioners sugar, 1/4 cup at a time until spreadable. If it's too thick, add a teaspoonful of milk until desired consistency is reached. Lift the cake out of the baking pan and set it on a table. Use an offset spatula to spread the icing over the sponge cake. 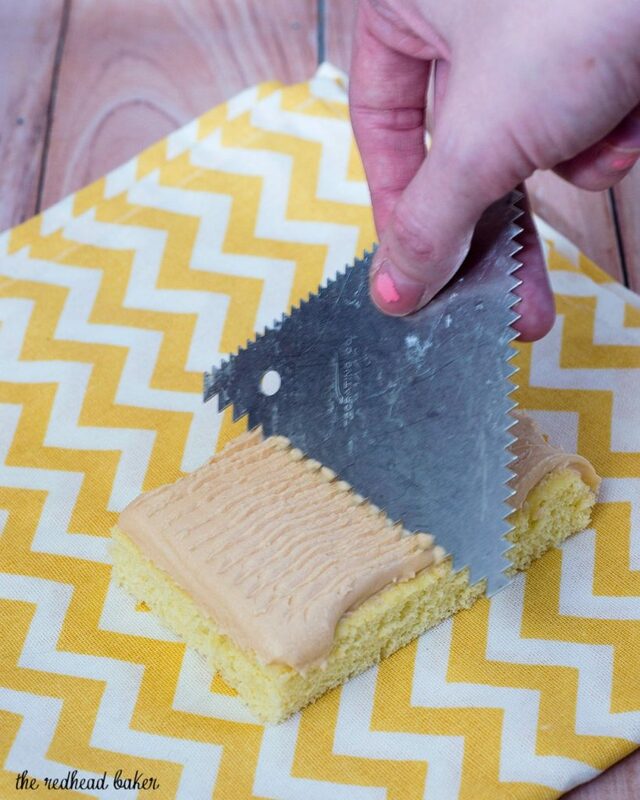 Use a large knife to the cut the cake into 12 bars. Oh my! I think I gained 10lbs looking at this! It looks sooooo good!!! I have always always wanted to try TastyKakes, alas they are not available near me … I check a lot 😉 This homemade version sounds fab! I have heard of TastyKakes, but I’ve never actually had them. Your homemade version looks delicious! 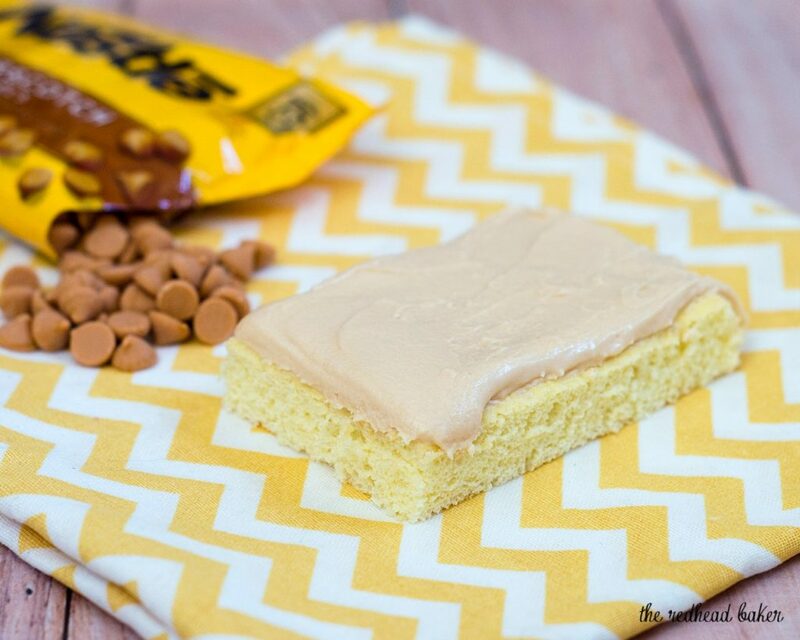 Love your take on one of the best TastyKakes! Hey neighbor, love the krimpets. Butterscotch is my favorite.